BRILLIANT: Julia Krajewski salutes the crowd on Chipmunk. Picture by James Hardisty. 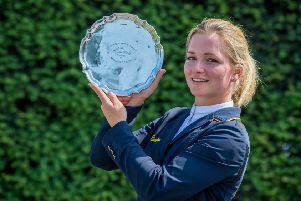 GERMANY’S Julia Krajewski blew away the opposition to win the flagship CCI three-star event at the 2018 Equi-Trek Bramham International Horse Trials with a record score on the ultra-impressive Chipmunk. 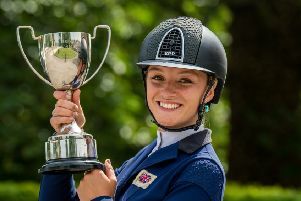 Rio 2016 Olympics team eventing silver medallist Krajewski stunned the crowds on the very first day of 2018 Bramham by producing a stunning dressage test which earned an eye-watering marks of 19.4 - a world record under the new dressage scoring system. That score gave the chasing pack a mountain to climb as it was yet Krajewski and Chipmunk then brilliantly went double clear over both their cross country and show jumping tests inside the time. Such was the pairing’s superiority, Chipmunk could have put two fences down in Sunday afternoon’s show jumping finale and still won yet a clear round in front of a packed crowd and under blue skies never looked in doubt. New Zealand’s three-time Bramham winner Andrew Nicholson finished a huge 8.6 points back in second on Swallow Springs with Australia’s Bill Levett third with 28.2 on Lassban Diamond Lift. Kitty King ended up the highest placed Brit on 29.4 in fourth on Vendredi Biats as new MBE and nine-time Bramham winner William Fox Pitt dropped down to 11th on Oratorio II who finished up with 34.7 after putting two show jump fences down. Rising Harrogate star Hazel Towers fared best of the hopes from Yorkshire with Simply Smart and Simply Clover both clear over cross country to finish 21st and 27th respectively on 51.3 and 69.3. Simply Smart was also clear over cross country. Northallerton’s London 2012 Olympic silver medallist Nicola Wilson retired One Two Many during their cross country test after problems at the water jump in which only brilliance in the saddle saved Wilson from a dunking. Folkton’s Phil Brown withdrew his mare Miss Brodie before the duo’s cross country test.